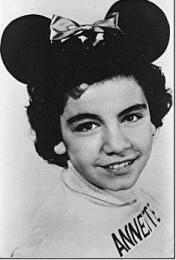 When we were born, Annette Funicello had already finished her childhood career as a Mouseketeer. She was the American Girl. She was born in Utica, NY. Her mother and father; Joseph, an auto repair shop owner and Virginia Funicello a homemaker, were Italian-Americans. As a child, she was very shy. Her parents enrolled her in dance and music classes to help her overcome her shyness. She was four years old when her family moved to Southern California. It was there, at the age of 12, that she was discovered by Walt Disney. He saw her at a dance recital. She was the Swan Queen in “Swan Lake”. He immediately chose her to be one of the original Mouseketeers. Annette Funicello was the only Mouseketeer chosen by Walt, and she ended up being one of the most popular. After her "career" as a Mouseketeer on the Mickey Mouse Club ended in 1959, she was still under contract with Disney. She appeared in several TV shows and movies as she grew up. One of my favorites (as a kid) was “The Shaggy Dog”. She became a teen idol after moving on from Disney to American International Pictures. As a teen, who didn't like seeing Annette, Frankie, and Moon Doggie, in the Beach Party movies in the 60's? She married her first husband, Jack Giraldi, who was also her agent, in 1965. They divorced in 1982. They had three children, Gina, Jack Jr. and Jason. She married her second husband, Glen Holt, a racehorse breeder, in 1986 and is still with him now. Annette Funicello began noticing that something was wrong in 1987, when she was working on the "Back to the Beach" movie with Frankie Avalon. She couldn't seem to keep her balance. In the beginning, she kept the symptoms from her family. Not too long after the balance problems, she noticed her eyesight seemed to be getting worse. After visiting the ophthalmologist several times in only six months and getting her glasses changed twice, he suggested she see a neurologist. The neurologist ordered an MRI to confirm a diagnosis of multiple sclerosis. She didn't really know much about MS and was more worried she might have a brain tumor. When the doctor showed her the pictures of the white spots on her brain, she was relieved. Only her mother and her husband knew that she had MS in the beginning. Physically she felt good for several years. She didn't tell her father for two years because she knew he would worry. She finally told him in 1989. It was difficult for him to keep it together when he saw his little girl. With her children, she told them it was a disease affecting the central nervous system (CNS). She would share with them little by little the symptoms she was feeling. Not knowing what would happen and when was hard for them. Annette had symptoms like tingling and numbness in her feet. She also had tingling in her hands. All these would come and go. One time she had a viral infection and a high fever. She lost her ability to walk and needed her husband to carry her to the bathroom. After three days, the fever and the symptoms went away. Cir has had this happen to him on more than one occasion. Any type of infection can cause your MS symptoms to flare up. It is important to try and keep from getting infections. We know this may be impossible to do all the time. While on a year long tour with her friend, Frankie, Annette Funicello felt she had to tell him that she had MS. He was shocked when he found out why she was having balance problems. In 1991, she had a return of the numbness and tingling in her feet. She also needed to use a cane when she began experiencing vertigo. Her sons friend saw her leaving a restaurant and told her son that his mom must have had a few too many drinks. Want to read the rest of the Annette Funicello story? Click the link below to go to Part 2.